EXOTIC TROPICALS Specializing in Cichlids, quality tropical fish foods and aquarium related products! We import and export tropical fish from San Antonio, Texas. Many species of cichlids from the Rift Lakes, Lake Victoria, Lake Malawi, Lake Tanganyika and Mexico. 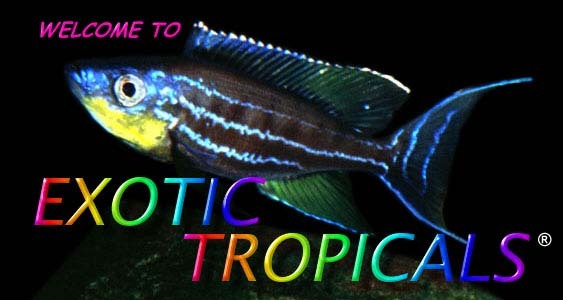 EXOTIC TROPICALS specializes in Cichlids, quality tropical fish foods and aquarium related products! EXOTIC TROPICALS stocks many species of cichlids from the Rift Lakes, Lake Victoria, Lake Malawi, Lake Tanganyika and Mexico. We import and export tropical fish from San Antonio, Texas. Check out our exlcusive foods on the Products Page! Thank you for visiting EXOTIC TROPICALS! EXOTIC TROPICALS is owned and operated by Gary Kratochvil. ©1997-2005 EXOTIC TROPICALS. All rights reserved.